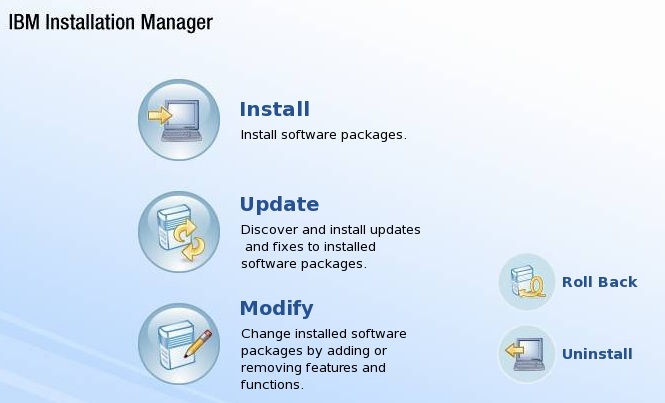 Here in this article we will Install WAS 8 using the IBM installation manager tool, please follow below steps by step process to complete the same. — Copy the downloaded agent.installer.linux.gtk.x86_1.4.4000.20110525_1254.zip file to a suitable location on your Linux server and unzip it. Take note of this location for future reference. — Decompress the ZIP file. — Ensure you have an X Window System (X11 for short) session running. — Copy the downloaded agent.installer.win32.win32.x86_1.4.4000.20110525_1254.zip file to a suitable location on your Windows server. Take note of this location for future reference. 2. Read the license agreement, and then select the I accept the terms in the license agreement radio option, and click Next. 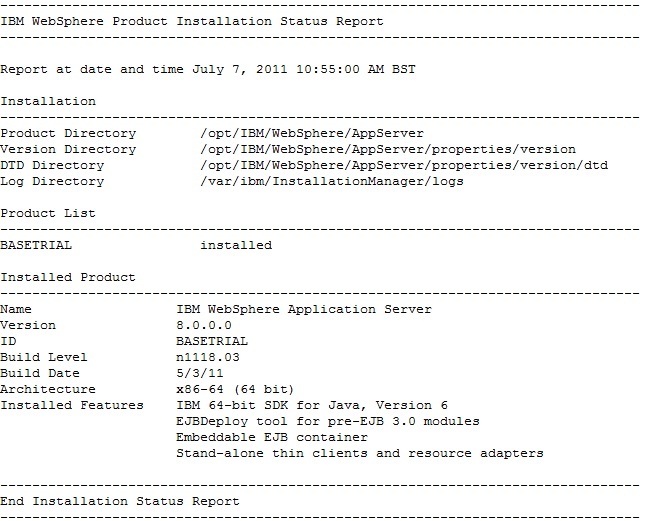 4. Review the installation summary information that is presented and click Install to perform the installation. 5. Once the IIM installation has completed, click the Restart Installation Manager button to restart IIM. 3. Before we can install WAS, we need to set the repository location preferences.This will inform IIM where the WAS repository components are located. Using the File menu, select the Preferences option. In the Preferences page, you can select the location of your WAS binary repositories. If you have a Passport Advantage account, you can set the appropriate authentication settings for downloading the commercial versions of IBM products and install from a local repository. 4. To add a repository location, click the Add Repository button located at the top right-hand corner of the preferences screen. 7. Click OK again to close and return to the main workbench screen. 8. From the main workbench screen, locate and click the Install button. 9. IIM will check online for the availability of the latest downloads and fix packs for the trial. Once the process has been completed, a list of installation packages will be presented. 10. Ensure that all the installation packages are selected. Click the Check for other Versions, Fixes and Extensions button and IIM will re-verify the available downloads online. Once the verification is complete, click Next. 11. In the following screen you will be presented with details of the actual WAS binaries and latest fixes that need to be downloaded from the online IBM repository. Click Next to continue. 12. You will now be presented with another license screen, this time for WAS. Read the license agreement, then select the I accept the terms in the license agreement radio option, and click Next. 13. On the next screen, you will be asked to fill out a questionnaire detailing your reason for evaluating WAS. Answer the questions as required and click Next to continue. 16. On the next page, select your preferred language, and click Next again, to move onto the features screen. Provided for backwards compatibility for generating EJB 2.0 deployment code. Provides a set of clients for a variety of technologies, such as JAX-WS, JAX-RPC, JAX-RS, XML, EJB, JPA, JMS, and others. 18. Consult with your application development team to understand whether you need to incorporate these two options, or not. — Installing the sample applications will add extra logging information to your installation and clutter the admin console, so it is recommended not to install these applications until you need them. They can be installed using IIM at a later date. 19. Also within the features screen, IIM will have already detected your Operating System (OS) architecture and pre-selected either the 32-bit or 64- bit IBM Software Development Kit option. Ensure this is correct for your OS. Click Next to continue. 20. Click Next to proceed to the final summary screen and review the options you have chosen in the previous steps. 21. Click the Install button to begin the actual WAS installation. Once the installation is complete, you will be given an option to run the Profile Management Tool (PMT) to create a WAS profile. At this stage, we do not want to launch the PMT tool. 22. Select the option labeled None and exit the IBM Installation Manager. All we have installed at this point is the base binaries into the location we specified. By looking at the files installed by the installer, you will see what makes up the base binaries. You will also notice that the folder permissions are rwxr-xr-x (755), which is a result of the 022 umask that we set before we ran the installation wizard. We will now do a quick check to see if the base binaries have installed correctly by running the WAS command script versionInfo.sh (which is found in the <was_root>/bin folder). We can generate a report that will identify the state of the installation.